Here at Delicious we’ve been helping Real Estate agents, offices, and brands to reach their marketing goals for over two decades. From logos, to signage, to interactive MLS websites we work closely with our clients to find solutions that drive conversions and customer loyalty. Our website design has stood the test of time with the back-end functionality that allows us to keep it current with content and add features as the customer’s needs and technology change. I feel very fortunate to have discovered the Delicious web design team and had your creative talents build a fantastic site. 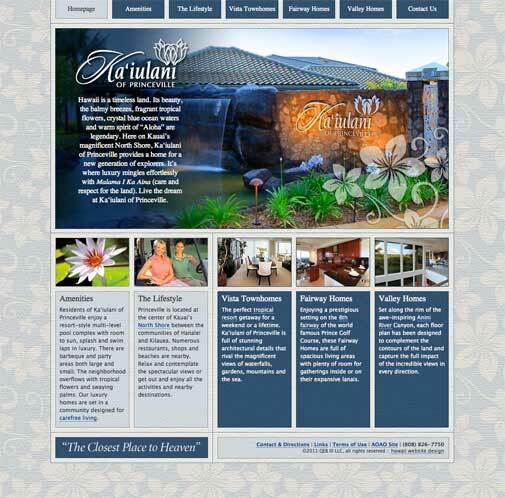 We developed this logomark for Bali Hai’s Vacation Rental Division. Our goal was to design an identity which would compliment the brand position that Bali Hai had cultivated over 30 years of doing business on Kauai’s North Shore — while creating an image that would resonate with the Hawaii visitors’ sense of adventure and discovery. Coldwell Banker Makai Properties has been the market leader on Kauai’s South and West Shores since 1979 and for over 30 years Makai’s clients have received a superior level of service and expertise. 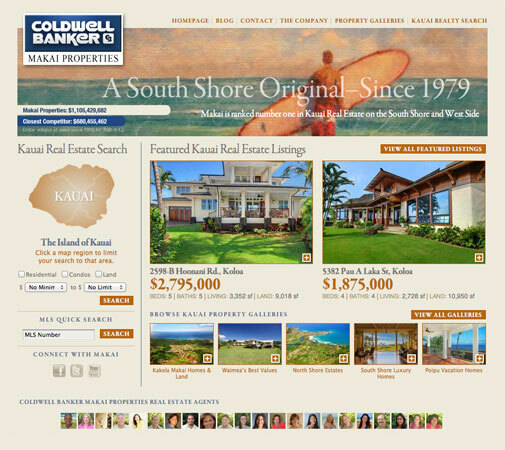 In late 2011, after more than 30 years of being the number one Poipu real estate brokerage, Makai Properties became a Coldwell Banker affiliate. To highlight this exciting change and cement their leadership position they came to us. The process began when we hosted a three-day brand seminar with their leadership team to clarify and define a unique value proposition and visual style which would set them apart from the competition. With a strong brand in hand, we then proceeded to build an easy-to-manage WordPress website that married strategic SEO with real time MLS data giving both their agents and clients a platform for internet success. Ka‘iulani of Princeville is a tropical resort community on the North Shore of Kauai, in an unrivaled location, with spectacular views in all directions. With only 77 luxury residences on 18 acres of prime real estate, residents enjoy privacy and spaciousness in a once-in-a-world ocean bluff setting. Click on the image below to explore the property. 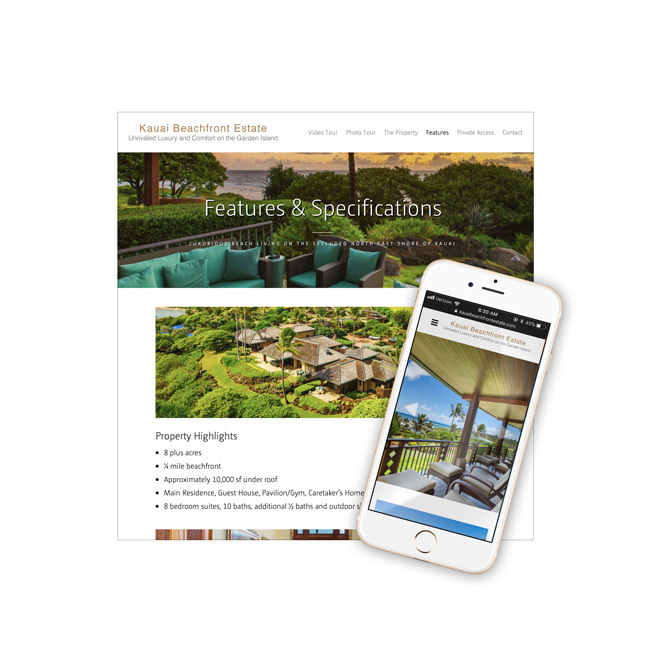 An upscale resort community located on the North Shore of Kauai between Kilauea and Hanalei, Ka‘iulani of Princeville came to us when they needed to update, refresh, and re-design their original Flash-based real estate website. We set out to build an easy-to-use and maintain WordPress website design which would leverage search engine optimization to attract visitors—and great resort photography and stylish design to keep their attention. Our client is very connected to Poipu, so her logo needed to reflect both the area and her personality. She is bubbly and vivacious, but also very professional and highly ethical. Her logo needed to have some of that personality, but also tie into the area and the company name. The colors are representative of both the client, and the area (Poipu: the sunny side of paradise! ), and “365″ shows up in the swirl that forms the “P”. Pretty sweet! This is actually three web sites in one. The main landing page, Poipu365.com, is representative of the overall brand and is used in marketing materials. PoipuBeachVacationHomes.com will take you to the vacation rentals section, and PoipuBeachRealty.com will take you to the real estate website design featuring MLS/IDX listings and information. The three sites together have synergy and are supported by a strong brand foundation. 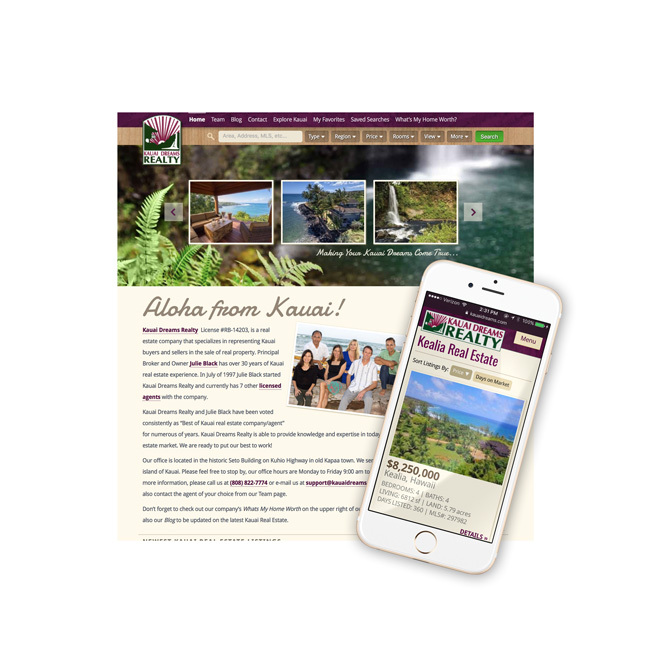 Bali Hai Realty came to Delicious Design when they needed a website to market a high end real estate listing on the Island of Kauai. The website’s simple elegance pushes the property to the forefront with exceptional photography and attention to detail. View the project here. 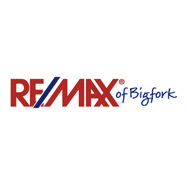 The Scott Hollinger Team is a market leader in the Flathead Lake and Bigfork region of Northwest Montana. 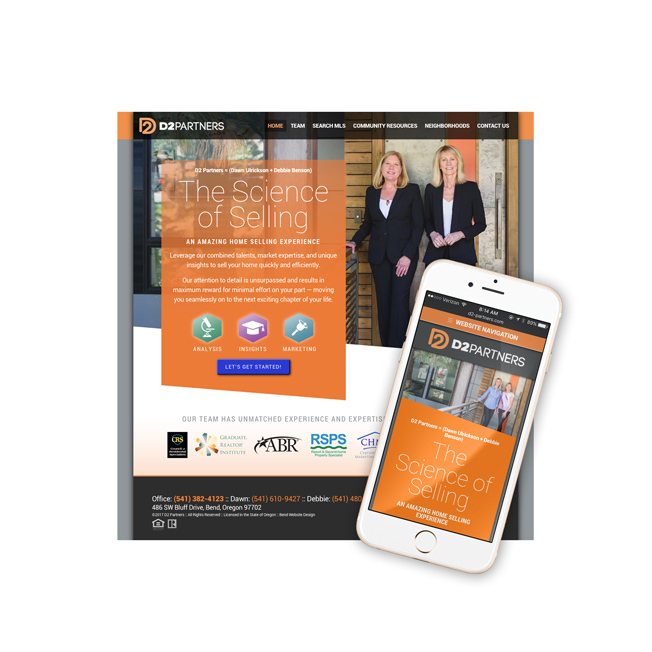 They consistently push the boundaries of what a great real estate website design can achieve—and their clients benefit from great exposure and a daily stampede of website traffic. They were one of the earliest adopters of the web as a real estate marketing platform—and they keep pushing the boundaries to get great results for their clients. Their mobile website design is no exception. This easy-to-use responsive website features several ways to find properties in the area: one-click “canned” searches; a full-strength advanced search form; and the coolest feature of all, a GPS-based search which shows you properties near your location. Coldwell Banker Bali Hai Realty contacted us to help them market this one-of-a-kind estate on the North Shore of Kauai. 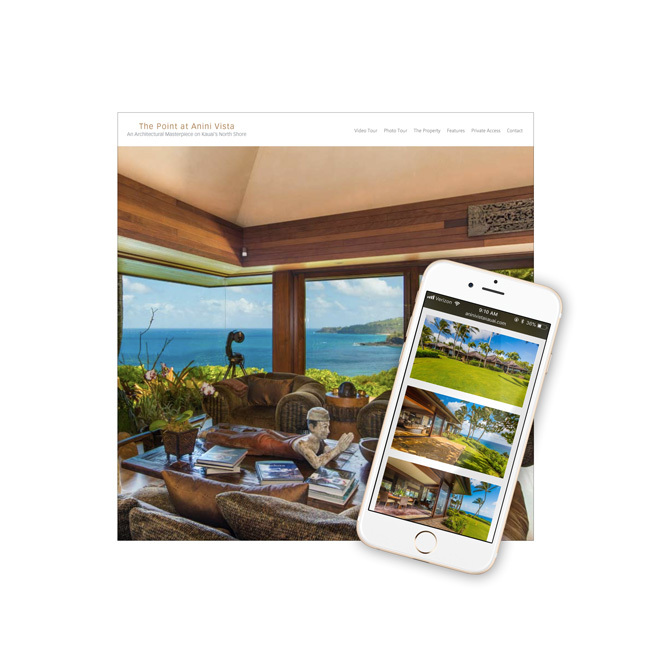 The exceptional location, outstanding architecture, and premium finishes of this home required an immersive website that would give potential buyers a reason to visit Kauai and take a closer look. 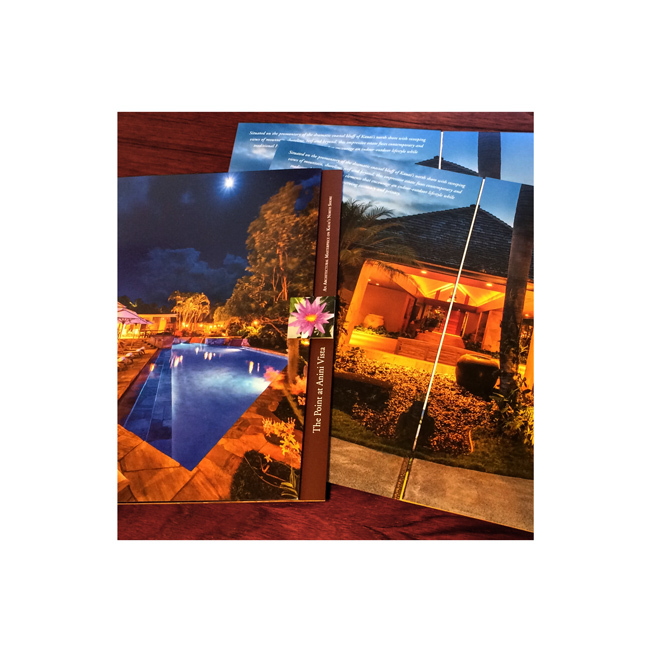 When Coldwell Banker Bali Hai was selected to represent the most exclusive estate in the islands, they came to Delicious Design to create a dramatic brochure that would make potential buyers take notice. This die-cut, gate-fold, oversized brochure is printed in four colors and two varnish plates on premium stock. Kauai Dreams Realty was founded by Principal Broker and Owner Julie Black in 1997. 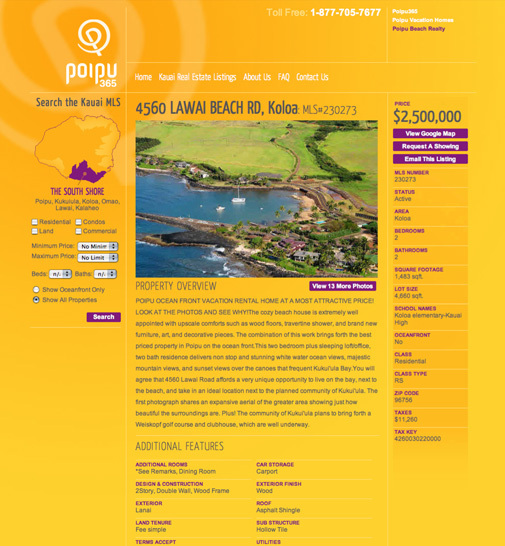 For three decades Julie and her company have been representing Kauai buyers and sellers and have been consistently voted the “Best of Kauai real estate company/agent.” The new MLS realty website we designed and developed for Kauai Dreams is 100% mobile responsive so users who visit the website with a phone get an experience that’s optimized for the small screen. Plus, because phones have built in GPS we’re able to give those users an interactive map of “real estate that’s nearby” — this gives the site an app-like feel and puts a wealth of real estate info at user’s fingertips. 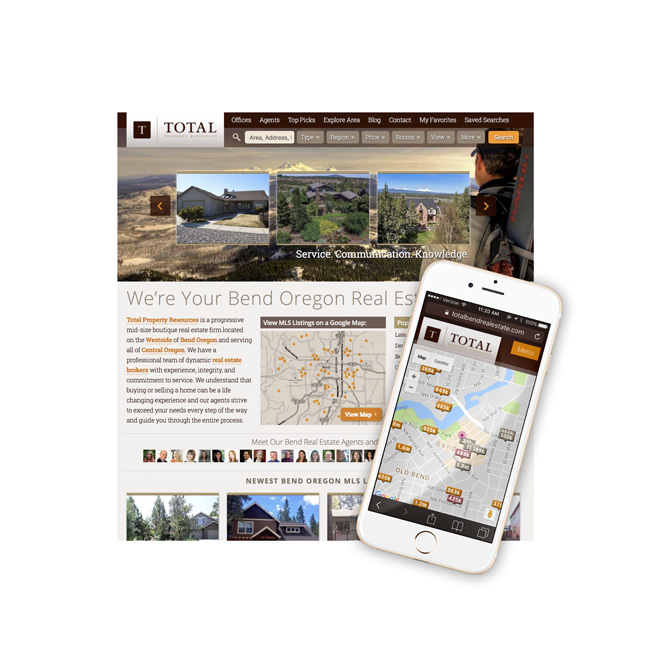 Total Property Resources is a creative real estate firm located on the Westside of Bend, Oregon. 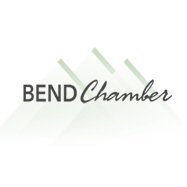 Their professional staff, agents, and brokers serve buyers and sellers of homes and property throughout the Central Oregon region. Our first website design project for a brand new client in Central Oregon, this mobile responsive real estate website for Total Property Resources features robust MLS search tools that allow users to find just the right Bend, Oregon home or property. Plus, we’ve made it easy to save your favorite properties and searches so the home shopping process is a breeze. 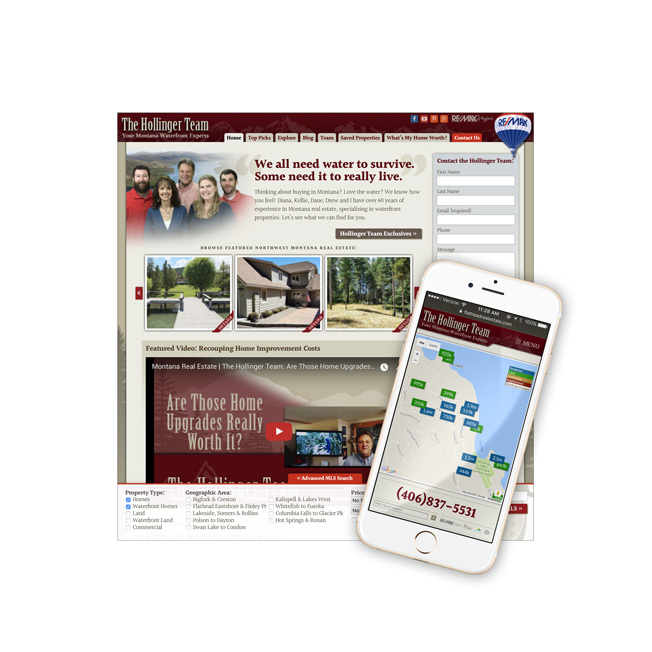 This mobile-responsive real estate website design for Total Property Resources features an easy-to-use GPS enabled property map which makes finding homes or property in Bend, Oregon a snap. After branding and designing a logomark for D2 Partners, we created this simple and effective WordPress website that illustrates these Bend real estate brokers’ unique difference and unmatched expertise. The Team at Delicious helped these great local realtors to brand — and name — their new partnership here in Bend, Oregon. After we presented eight strong concepts for their new logo, they honed in on a single direction which we then refined to arrive at this vibrant, modern logomark which you see here.